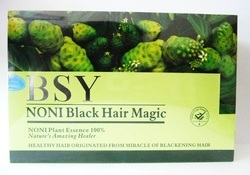 The Noni Black Hair Magic is formulated with various herbal essences such as noni, wild ginseng, wild ganoderma lucidum etc. It took the hair nutrition and health experts two years to develop. 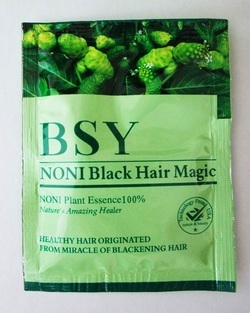 It contain natural ingredients that can rapidly turn your hair black naturally and healthy. Besides blackening your hair, it also have anti-dandruff and nourishing properties that bring nutrients to the roots of the hair and effectively prevent hair loss. Safe and healthy, without harmful side effects of hair dye chemical and won't damage the hair and your scalp. Serves as an Supplement Nutrient to the roots of your hair Combination of hair blackening, hair nourishment and hair conditioner in one convenient application. Say goodbye to dull white hair! 1. 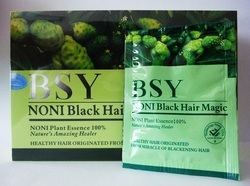 Herbal essence for hair nourishment: Noni, Polygonum multiflorum Thunb and wild ginseng, wild ganoderma lucidum etc. 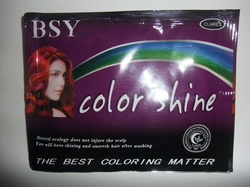 Its blackening effect is six times of normal blackening shampoo. 2. Convenience: instant black after light usage, requires only 7 MINUTES to blacken your hair from root to end, whenever and wherever you are.